This is a major part of Skyrim and a lot of environments, characters, and cutscenes are dedicated to it. This is a shame, because the Thieves Guild questline is a mess. It’s unnecessarily terrible, failing at multiple levels and attempting things that aren’t even needed. Check out his analysis at Twenty Sided. In Skyrim, certain NPCs are marked in the game’s code as “Essential.” While most of the characters in the game can be killed, Essential characters can’t. If they take enough damage, they drop to one knee, then eventually recover their health. Usually this is because they’re important to some quest. The game designers didn’t want players to accidentally block off any content, so any important NPC is invulnerable. In Maven’s case, her invulnerability goes beyond being unkillable. You also can’t meaningfully decrease her power or hurt her. 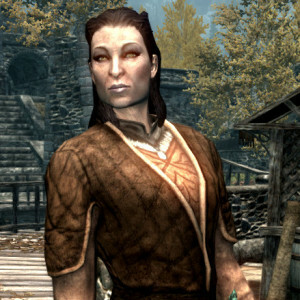 At best, you can steal a horse from her family; at worst, you destroy her competition by poisoning mead as part of the Thieves Guild questline and make her Jarl (de jure ruler) of Riften as part of the Imperials questline. There is no way to bring her to justice for her corruption or meaningfully improve the city’s situation. The city of Riften is a hive of villainy sitting in a fetid lake. It’s home to a brewery industry ruled by a petty villain, an orphanage with a sadistic headmistress, and the province’s Thieves Guild. The only local institution of any merit is a temple to Mara, the goddess of love and compassion. When you arrive in town, the guards extort you for money before you can even pass through the gates. It serves as the perfect place for the game’s evilest profession2. and Roger Zelazny’s Shadowjack as his primary inspiration for adding the “thief” class (later renamed “rogue”) to Dungeons and Dragons. Of these, Cugel seems to be the closest to an actual criminal; the rest are really treasure-hunters, skilled in avoiding danger and surviving through stealth, skill, and cleverness rather than brute strength. They tend to steal from ancient tombs or dread monsters, not everyday folk. Games traditionally cast the thief as the mundane specialist of an adventuring group. The fighter is there to keep the front line and swing a weapon, the mage is there to cast spells from a distance, and the thief takes care of traps, locks, and vulnerable turned backs. In Skyrim, however, any character can do any of these tasks, and it’s not practical to be a member of a party. The Skyrim thief, therefore, is someone who chooses to steal things from people. The fighters guild (the Companions) are mostly-moral mercenaries. The mages guild (the College of Winterhold) are generally isolationist academics. The Thieves Guild is the only main employer in the game that hides its headquarters and makes its business to commit crimes and harm people’s livelihoods. When games portray fictional worlds, they make implicit statements about the nature of the real world. By placing the Thieves Guild — one of the game’s three major employers — in a corrupt town ruled by a coldhearted mead magnate, Skyrim makes a statement about criminals and morality. Criminals come from bad places, and there’s nothing you can do to improve the situation. Of course, in our world there is a strong statistical correlation between poverty and crime. Poor people are more likely to be the perpetrators of and the victims of crime then people in a higher socioeconomic class. This seems reflected in Riften: there is a large homeless population and the city does not seem to be as wealthy as many of the other cities of Skyrim. The big statement that the game makes, however, is that this problem is intractable. No matter how hard you try, you can’t depose the corrupt businessfolk or the leaders of organized crime. Once a place is lost to crime and poverty, nothing you can do will improve it. Some storylines in the game have choice; some allow you to affect the outcome. In this case, the designers decided that you could do nothing. Maybe the reason I want so badly to kill Maven Black-Briar isn’t her rudeness or her petty, banal villainy. Maybe it’s because she represents a threat to my fundamental optimism. I want to believe that we can improve the problems of poverty and crime and make our society safer and healthier. But Maven can’t be killed.